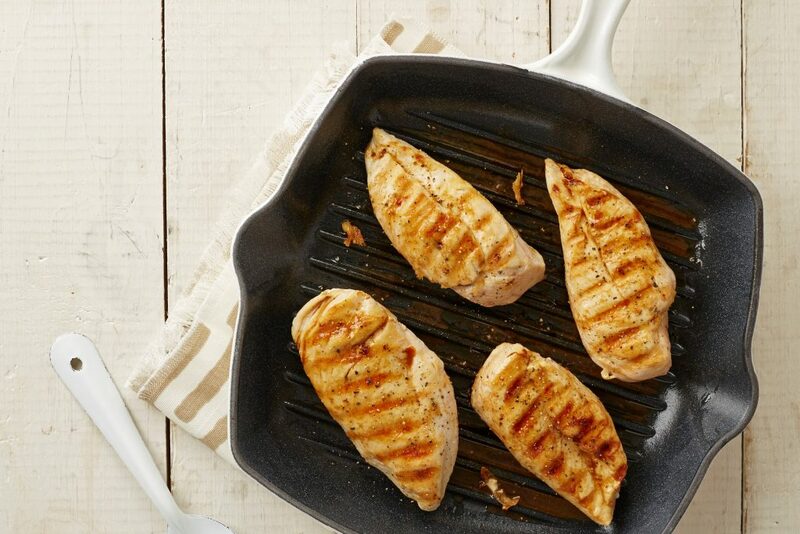 By following a few basic cooking principles when preparing chicken fillets, you never need to have a dry, tasteless chicken fillet on your plate (or battle to swallow it). I often hear that people don’t enjoy chicken fillets, as they complain that it’s too dry. When frying it for a short time over the correct temperature, you can have a different experience. Use a pan with a wide, solid base that can retain the heat well and start over a medium temperature – AMC Cookware is perfect for this. A medium temperature allows the fillets to sauté to a golden brown colour, without burning. Then I turn the stove plate to its lowest setting, cover the pan with a lid and continue to cook the fillets for only another 5-7 minutes. Fillets which cook for too long over too high a temperature, dries out quickly. Remember that a chicken fillet has very little fat of its own, making it a healthier cut of meat. Other chicken portions have more fat, which helps to keep it moist and succulent. When cooking fillets, one has to use a cooking method that will retain the natural juices and keep is most and juicy. Follow this basic method, as described, and prepare a delicious variety of meals. Don’t be disheartened by the lengthy description. It’s as detailed as possible to give all the necessary tips and guidelines for the best results. Apply the same principle when cooking fillets for any other recipes. Whether you are going to slice the fillets, fill or crumb them or make it part of a dish, the secret remains the same – don’t make the pan too hot and don’t cook it for too long. 1. Heat the oil in a frying pan over medium heat (like an AMC 28 cm Chef’s Pan). Sauté fillets for only a few minutes on the one side, presentation side first, until golden brown. You will be able to see the meat changing colour. Season to taste. 2. Turn fillets over and sauté on the other side until golden brown. The fillets will not be cooked through at this stage. 3. Don’t be tempted to turn the fillets over too many times and don’t sauté it until completely cooked, as the meat will dry out too easily. 4. Season the other side to taste. Turn the fillets over again, to have the presentation side down. 5. Reduce the heat, pour the lemon juice or wine into the pan and immediately cover with a lid. The liquid will steam a lot, but keep the lid on and remove the pan from the heat for a moment, if necessary. 6. Allow the fillets to cook for only 5-7 minutes. If they are very thick, test after 5 minutes by gently pressing on the thickest part. The meat should still be slightly springy in the middle and juicy when you slice it, but not pink at all. 7. Serve hot or as room temperature with a side dish or salad of your choice. Or allow to cool, cut into smaller pieces and add to a salad or sandwich. The chicken fillets are also delicious served as a homemade chicken burger. 1. Use a cooking liquid of your choice, such as wine, stock, verjuice, fruit juice or rooibos tea. It will form a gravy with the pan juices and is delicious to spoon over the meat, starch or veggies. Any flavoured oil, like Westfalia Lemon Flavoured Avocado Oil will add extra flavour to a simple dish. 2. For more chicken recipes, go to pages 158-161 of your copy of Make five. If you don’t have a copy of this recipe book, go to the Recipe books page to order one.